It’s the weekend and you’ve promised your family that today’s the day you’re going to get started on painting the living room. Finally. After preparing the walls, you’ve chosen the paint, you’ve readied all your brushes, rollers or paint sprayer. You’ve even put down a drop cloth. You’re ready to get going. You’re not going to bother with taping off the trim or the ceiling. Who needs it? You can paint in a straight line, surely. And that’s where you’ll make your first mistake. Take it from someone who has learned the hard way: the hassle of taping off your surface before you start painting is well worth it. It results in far less mess and a professional finish that is straight and sharp as a razor. Start by preparing the surface so it is free of dirt and ensuring it is dry. The easiest way to dust off surfaces, especially trims and mantles, is with a clean, dry paintbrush. Tear off sections of painters tape no longer than an arm’s length. Any longer and it becomes too unwieldy. You want the tape to stick to the surface you’re painting, not your own body. Place the tape where you want it, gently tapping it in place for now. Once you have the tape in place, you can use either your fingernail or a rubber palette knife to ensure the tape is stuck down firmly. 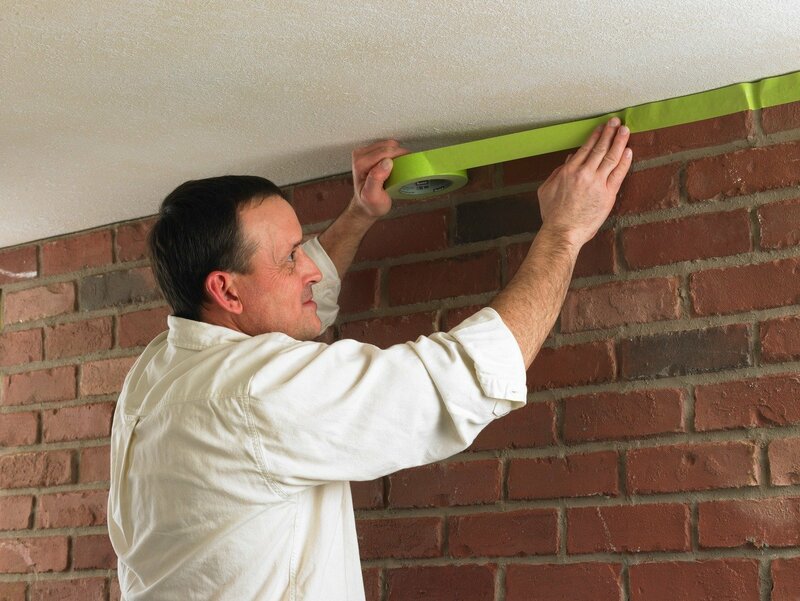 Be sure to remove any bubbles, which will allow paint to seep under the tape. Don’t cut corners, literally. Make sure you cut the tape flush with any corners, like those between the doorjamb and the skirting board. I usually leave a little extra tape, then trim it off with a cutting tool. And be sure to mask off the light switches and plug holes. I keep my painter’s tape in a ziplock bag, so it doesn’t get dirty or become tacky due to moisture. Most professionals advise you to remove the tape while the paint is still wet or dry to the touch. Obviously, the paint can’t be too wet, or else it will run onto the surface you’re trying to keep clean. But if the paint is too dry, it might peel when you remove the tape. When painting two coats and want to wait a day between coats, remove the tape after the first coat and re-tape the next day. If you leave the tape on for too long, it can leave some residue. If you are left with some residue, it comes off quite easily with a touch of WD-40. Before removing the tape, I’d suggest running a cutting tool along the side of the tape to ensure it comes away neatly. Don’t yank the tape off. Remove it slowly and carefully at an angle of about 45 degrees. If paint starts coming away, use your cutting tool to cut it back. First off, you must use the right tape for the right surface. A heavy-duty tape won’t work well on a delicate surface. And vice versa. Most tapes are graded according to how many days you can leave it up without leaving a residue. Most painters tapes are graded for 7-14 days. Those that are longer rated use less adhesive and are used for more delicate surfaces like wallpaper or freshly painted surfaces. The best painters tape leaves no residue when you pull it up. In addition, it cannot be too thin or else the paint will seep through to the surface. And you don’t want tape that will coil in on itself when you tear it off. That’s a huge irritation when painting. It was a 3M employee who developed masking tape way back in 1925, so it’s fitting we start with their product. They seem to have a tape for every application. This one can be used on a variety of hard-to-stick and hardy surfaces such as brick, concrete, and wood. The tape is a bit stronger than other tape but it still tears when you need it to tear. And you can pull off long strips without it tearing in the wrong place. Best of all it won’t lift or curl. I probably wouldn’t recommend this for more delicate jobs but it is the best painters tape for wood. Also made by 3M, this tape is the best-selling tape in the US. When professionals refer to “the blue tape” this is the one they have in mind. It is UV-resistant and can be used indoors and outdoors on a wide variety of surfaces, including curved and uneven surfaces. It can be removed cleanly, up to 14 days after application, without leaving any residue. Scotchblue comes in a variety of widths from 0.7 inches upwards, so it is very versatile. Every toolbox needs a roll of this tape. The best painters tape for curves, it will always result in sharp, clean paint lines, and can be applied quickly and easily. The green to ScotchBlue’s blue, FrogTape features a patented Paintblock technology to keep paint from seeping through the tape. And it keeps the lines sharp and straight. If you’re using it on an inside job, you can leave it up for up to 21 days without leaving any residue. If it’s in direct sunlight, the manufacturers say you can leave it for up to seven days. There is also a yellow Frogtape for more delicate surfaces. This, for me, is the best painters tape for trim. A bonus is that Frog tape also comes in a handy storage container, which keeps it dry and dirt-free. This one is for the artists out there. XFasten’s blue painter’s tape is an ideal alternative to expensive artist’s tape because its adhesive is mild and won’t damage the surface. Though I’m no artist, I reckon it’s the best painters tape for canvas. It works really well on glass too, so it’s a two-for-one: it’s also the best painters tape for glass. Its anti-bleeding properties result in sharp lines and narrow edges. If you want, it can stay up for 60 days and can be exposed to direct sunlight. Most important, it won’t cause any surface damage, so your work of art will remain pristine. And it comes in a roll of three so you’re getting value for your money. I chose this tape because of its name. Come on, who can resist a name like SnotTape? This tape is a bit stickier than the others, making it the best painters tape for textured walls. It features a patented adhesive technology – a polyurethane gel – that forms a complete barrier between the surface and the paint, preventing paint bleed. There is a less sticky version of Snot Tape for more delicate surfaces. Don’t get them confused. The SnotTape is easy to stick and it doesn’t curl up on itself. And best of all, the manufacturer says it can be re-used. How can you turn your nose up at that? When it comes to painting, that old adage “more haste less speed” applies. So, if you want a crisp, clean, professional finish, take the time to apply painters tape. You won’t regret it.